You can join WANG by checking the the WANG boundary map (see below) to be sure that you reside within WANG’s area of coverage. Then contact the membership chair and arrange for dues payment. You can now print out an online application (see below) to send in. Membership dues are $30/year per family; $15/year per family for students and seniors. Businesses and individuals may also support WANG at these levels: Friend $50; Patron $100; Benefactor $250; Sustaining/Business Friend $500 and Business Sustaining $1,000. Check the WANG boundary map below to be sure that you reside within WANG’s area of coverage. 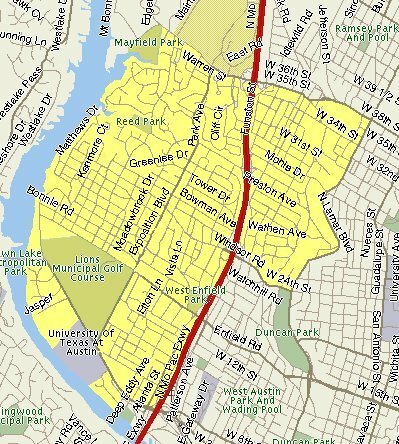 WANG’s boundaries are 35th Street (including Laguna Gloria and Mayfield Park) to the north; Shoal Creek to the east (excluding the area east of Mopac and south of Windsor), and the Colorado River (including Lady Bird Lake and Lake Austin) to the south and west. Pay your dues through PayPal using your Debit, Credit Card or PayPal account.